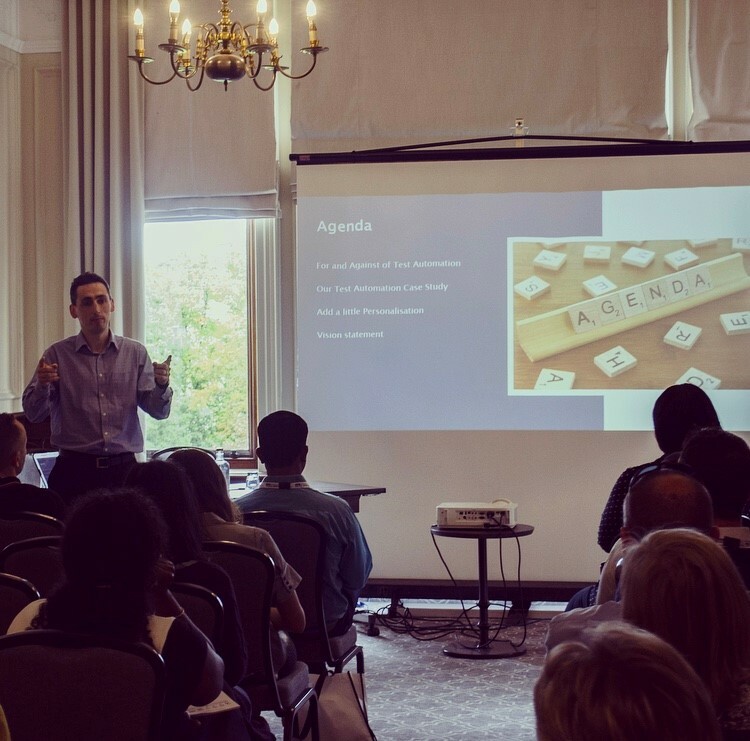 Daniel Woolfson, Head of Development & Test at PureNet, describes his experience and speaking opportunity at Software Testing Conference North on Tuesday 18th and Wednesday 19th September 2018. “I relished the opportunity to attend a Testing conference on my home turf in the beautiful City of York. Having access to two full days of learning, networking and sharing experience about the latest trends in Testing and QA was an opportunity not to be missed. I was also invited to speak on a subject of my choosing – more on this later. There were two tracks of presenters on both days, keynote presentations and more and I had to be quite selective on what sessions to attend. My strategy was to attend talks based on their content so that we can concentrate on improving our service offering to our clients. Nowadays industries meet at an intersection in that we are all “information processors” in some form – sector is no longer a barrier for tech. The titles of the presentations guided my choices to attend. First up was “4 ways AI is going to Transform Testing” by the CTO of EggPlant. It was interesting for me to see how AI could apply to the Software Tester profession. As there are only so many types of screens in business applications, I learnt that AI can support the generation of test cases. Segmenting test scripts comes from learning what is determined an “effective” test, further ensuring our clients’ B2B websites operate smoothly across devices. The second presentation I attended at the Software Testing Conference North was “Agile in a Regulated World” by MoneySuperMarket.com. This was quite a turning point for me in listening to the experiences of an Agile advocate (like myself) in a Financial Services setting. The key take-away here was the focus that automation returned two benefits for compliance – in that once an action is automated – it is repeatable, traceable and can be observed easily – which qualifies for the requirement of Compliance and Audit and provides time-saving benefits for the business. Moving on to listening to the Senior Test Manager from the BBC, “Modern Test Management” was a walkthrough of the principles and approach from the BBC Test Team. They spoke of the REPEAT framework i.e. Reuse, Enable Delivery, Provide info, Effectiveness, Advocacy and Think holistically. The Test Team focus on learning from others, test the existing process, inform others on coverage and risk and using right test at the right time, championing bugs and thinking about internal and external quality. Awareness at all stages of the Test Lifecycle is key to improvement and can make something impactful for the client. At PureNet, our Test Team is made up of extremely skilled Ecommerce testers with a large amount of industry experience. We complete a comprehensive checklist before your solution goes live and have implemented processes to ensure our clients are informed about the test stages.